The early sawmill operations of Wiregrass Georgia required a constant supply of timber to maintain production and profitability. Smaller sawmill operations could be moved close to the timber tracts where logs were being cut. For larger operation, such as the Clements Sawmill on the tracks of the Georgia & Florida Railroad at Ray City, logging timber typically involved transporting cut logs to the sawmill by skidder and tram. Skiddermen like Claudie Royal, Robert Christopher Powell and Lawrence Cauley Hall used two wheel “Perry” carts pulled by a team of horses or mules to drag or skid felled logs. According to U.S. Bureau of Labor Statistics 1918 publications, in Georgia a typical skidderman worked a 60 hour workweek, for a wage of 22.5 cents an hour, or $13.50 per week. The skiddermen dragged logs from where they were cut the short distance to the tracks of the railway tram, where they were loaded and hauled to the sawmill. Oxen could be used pull skidders in areas too wet for horses or mules, but even oxen couldn’t skid logs out of the deepest swamps. Ten Mile Bay northeast of Ray City was one of the first places in this section where logs were hauled out of the swamp by overhead skidder. At Southernmatters.com, Bill Outlaw relates how the deep swamp of Ten Mile Bay provided a hide out for Confederate deserters and draft dodgers during the Civil War. You can read Bill’s observations on Ten Mile Bay at http://www.southernmatters.com/image-database/upload/Nashville/Nashville-051.html The fact was, there were significant numbers of Southerners who did not support Secession or the war. Outlaw describes Ten-mile Bay as lying east of a line drawn between Alapaha and Nashville. William M. Avera, son of Daniel Avera and Tobitha Cook Avera, constructed an earthen dam from 1880 to 1884 across the lower end of Ten Mile Bay. This impoundment at the southern outfall of the bay created the Avera Mill Pond (now known as Lake Lewis), the mill run forming the Allapacoochee Creek (now known as Ten-mile Creek), which is the eastern boundary of the W.H. Outlaw Farm. Beyond the actual bay, a considerable area of land is quite swampy. When the Bootle & Lane sawmill brought overhead skidding to Berrien County in 1917 to log Ten-mile Bay, the news was reported in the Lumber Trade Journal. 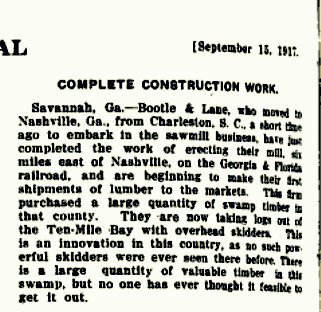 Savannah, Ga. – Bootle & Lane, who moved to Nashville, Ga., from Charleston, S. C.. a short time ago to embark in the sawmill business, have just completed the work of erecting their mill, six miles east of Nashville, on the Georgia & Florida railroad, and are beginning to make their first shipments of lumber to the markets. This firm purchased a large quantity of swamp timber in that county. They are now taking logs out of the Ten-Mile Bay with overhead skidders. This is an innovation in this country as no such powerful skidders were ever seen there before. There is a large quantity of valuable timber in this swamp, but no one has ever thought it feasible to get it out. The overhead skidder was powered by a steam engine which could be moved from place to place on a logging railroad flatcar. The steam engine drove a drum around which there was a steel cable which would draw in the logs to drier land where they could be loaded and conveyed to the sawmill. The steam-powered rig could drag logs from the swamp up to 900 feet in all directions. Where this equipment was used to pull logs along the ground it was referred to as a “ground skidder” or “possum dog skidder.” But when the system of steel cables and pulleys were rigged from trees allowing logs to be suspended and hauled out above the muddy swamp, it was called an overhead skidder. Operating steam powered skidders was dangerous work. The logs being pulled in would sometimes encounter obstructions. Then the flying logs could move in erratic and unpredictable direction. The steam skidders were worked by teams of men, and communications were passed from the crews to the skidder operator by flagmen, such as Henry Howard Thompson of Ray City, who signaled when the logs were ready to pull. The men knew to stay away from a log on the skidder line. 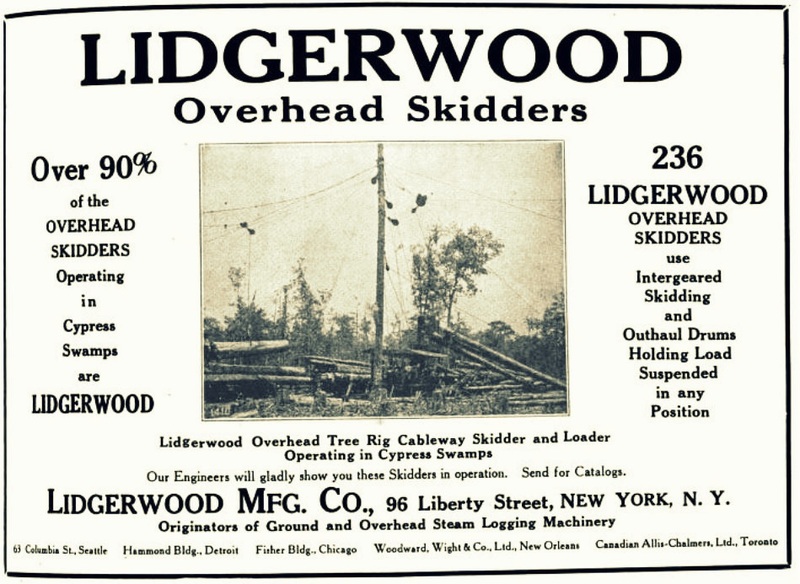 Advertisement for overhead skidders manufactured by Lidgerwood Mfg. Co. appearing in the Lumber World Review, November 10, 1921. 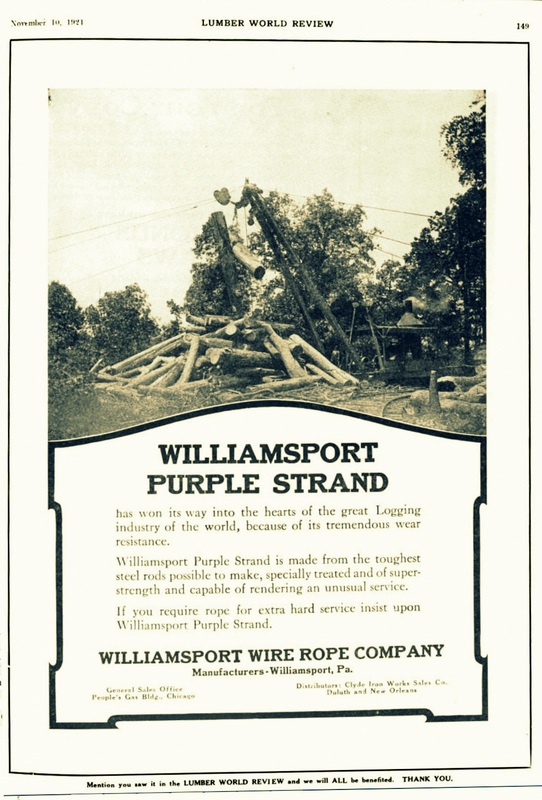 Overhead skidders were used by the Bootle & Lane Sawmill to extract timber from Ten Mile Bay, about seven miles northeast of Ray City, GA.
Advertisement for steel cable used in overhead skidder operations, manufactured by Williamsport Wire Rope Company, appearing in the Lumber World Review, November 10, 1921. 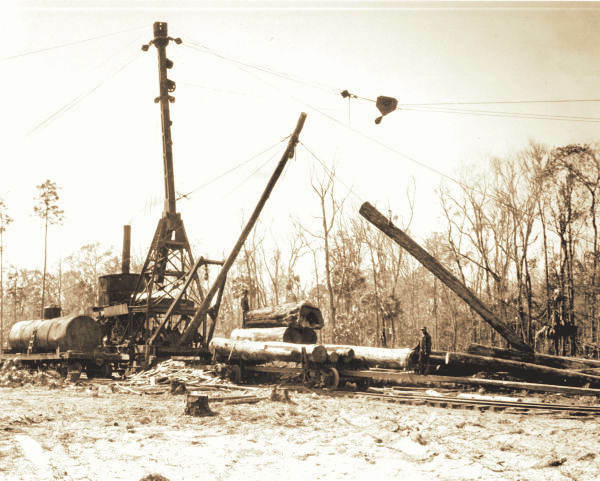 Overhead skidders rigged with pulleys and steel cables were used by the Bootle & Lane Sawmill to harvest timber from Ten Mile Bay, about seven miles northeast of Ray City, GA.